- The inner core the layer furthest away from the crust. 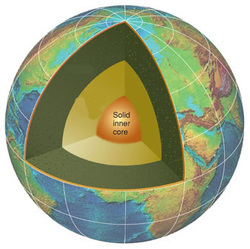 - The solid inner core is the very center of the Earth. - It is a ball-shaped and about 1,220 km in radius. - The inner core is about the size of 70% of the Moon. - The inner core is made of iron-nickel alloy and possibly silicon and carbon. - It is believed that the inner core has a similar temperature to the Sun's surface, approximately 5,550 °C!